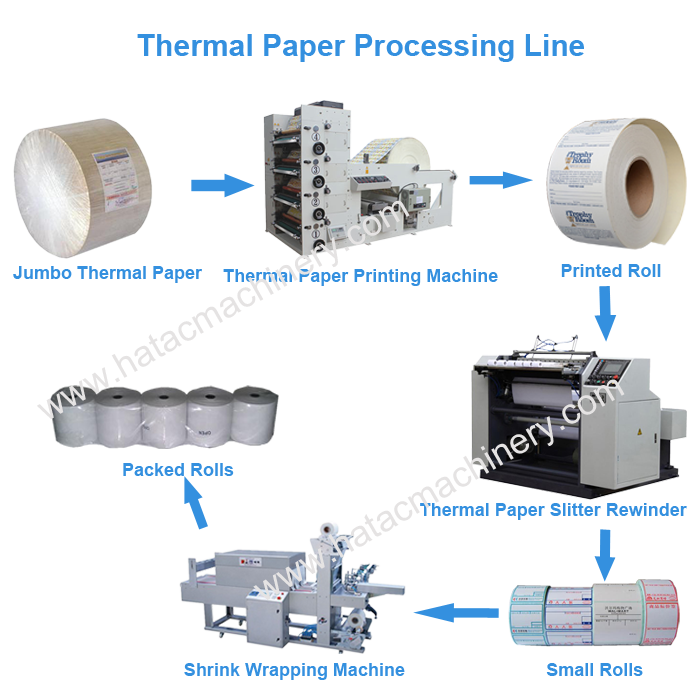 Making thermal paper rolls generally requires thermal paper printing machine,thermal paper slitting rewinding machine and core machine. 1. Thermal paper printing machine is for printing jumbo roll. 2. Thermal paper slitting and rewinding machine is for slitting printed jumbo roll into small rolls.It can be rewind by paper cores and plastic cores. 3. To rewind by paper core,it will require kraft paper slitting machine,paper core making machine and paper core recutter. 4. To rewind by plastic core,it will require inject moulding machine. 5. Rolls can be pack by manual or by shrink packing machine.